Sridhar Sathvik, B., Gopalakrishna Narahari, M., Chennabasappa Gurudev, K., Parthasarathi, G. (2009). Impact of Clinical Pharmacist-Provided Education on Medication Adherence Behaviour in ESRD Patients on Haemodialysis. 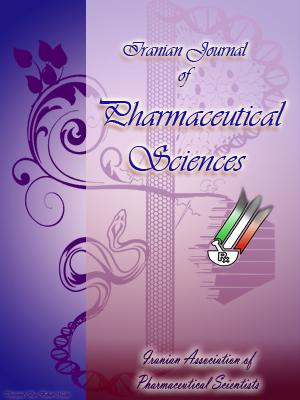 Iranian Journal of Pharmaceutical Sciences, 5(1), 21-30. Belagodu Sridhar Sathvik; Moda Gopalakrishna Narahari; Konana Chennabasappa Gurudev; Gurumurthy Parthasarathi. "Impact of Clinical Pharmacist-Provided Education on Medication Adherence Behaviour in ESRD Patients on Haemodialysis". Iranian Journal of Pharmaceutical Sciences, 5, 1, 2009, 21-30. Sridhar Sathvik, B., Gopalakrishna Narahari, M., Chennabasappa Gurudev, K., Parthasarathi, G. (2009). 'Impact of Clinical Pharmacist-Provided Education on Medication Adherence Behaviour in ESRD Patients on Haemodialysis', Iranian Journal of Pharmaceutical Sciences, 5(1), pp. 21-30. Sridhar Sathvik, B., Gopalakrishna Narahari, M., Chennabasappa Gurudev, K., Parthasarathi, G. Impact of Clinical Pharmacist-Provided Education on Medication Adherence Behaviour in ESRD Patients on Haemodialysis. Iranian Journal of Pharmaceutical Sciences, 2009; 5(1): 21-30. The aim of this research is to assess the impact of clinical pharmacist-provided education on medication adherence in haemodialysis patients. Ninety haemodialysis patients were randomized into two groups. Brief medication questionnaire (BMQ), a tool for screening adherence was administered to both groups at the baseline to assess adherence to antihypertensives, vitamin D analogues, phosphate binders and folic acid in haemodialysis patients. The intervention group received education regarding their medications by a clinical pharmacist over seven weeks. The control group received standard care. At the end of eight weeks, BMQ was once again administered to patients of both groups. At the baseline, there was no significant difference in the mean BMQ regimen, belief, recall and the medication access screen scores of the control and intervention groups. At the end of the eighth week, there was a significant drop (p<0.05) in the mean scores of regimen, belief and recall screens of BMQ in the intervention group, indicating an improved level of medication adherence. For the control group, there was no significant drop in the mean BMQ screen scores. The reported level of non-adherence was the highest for phosphate binders. We conclude that clinical pharmacist-provided education was effective in improving adherence behaviour of haemodialysis patients. Haemodialysis patients are usually on complex drug regimens and receive on average 8 to 10 medications daily, many of which require multiple doses per day . Due to polypharmacy, frequent medication adjustments between dialysis and non-dialysis days, medically-unstable nature of the disease and restricted lifestyle, dialysis patients are at high risk of drug-related problems and nonadherence [2, 3]. Patient-focused interventional strategies such as identification and removal of barriers to medication adherence, patient education and cognitive behavioural strategies may improve adherence to treatment regimens [9, 10]. Clinical pharmacists' involvement in dialysis patients' management is reported to enhance medication adherence [11, 12]. End stage renal disease (ESRD) is one of the major public health concerns in India. The number of patients requiring haemodialysis treatment is increasing [13, 14]. In India, to the best of our knowledge, the medication adherence pattern of haemodialysis patients has not been studied. No data is available regarding the involvement of pharmacists in the medication therapy management and provision of pharmaceutical care services to dialysis patients in Indian population. The objectives of this study were to assess the impact of clinical pharmacist education on medication adherence in Indian dialysis patients and to assess the demographic char-acteristics associated with it. The study was approved by "The Institutional Ethical Committee of JSS Medical College and Hospital", Mysore. The randomized case-control study was conducted in the dialysis units of JSS Medical College Hospital and Basappa Memorial Hospital, Mysore, from April 2004 to June 2005. (c) receiving their scheduled medications for at least one month prior to commencement of the study. Patients with multiple organ failure or malignancies, who were on short-term/irregular dialysis, or who had impairment of consciousness or severely disabled were excluded. Only eligible patients were enrolled who were able to sign their informed consent. A total of 102 eligible haemodialysis patients were randomly assigned to intervention or control groups using block randomization. The demographic and disease characteristics of the patients were obtained from patients' case notes and patient interview. score of ≥01 denotes a positive screen representing the patient-reported non-adherence regarding his/her medication regimen, while a score of zero denotes a negative screen, signified patient adherence to the prescribed medication regimen. The higher the BMQ score, the higher the reported rate of non-adherence . BMQ was administered to both study groups at baseline and at the end of week eight. Adherence was assessed for four classes of medications (antihypertensives, vitamin D analogues, phosphate binders and folic acid) commonly received by haemodialysis patients. Table1. Demographic characteristics of the study patients. The intervention group received clinical pharmacist-provided education about their medications for seven weeks. The education time was limited to 20-25 min., twice a week. The patients were interviewed and educated by a clinical pharmacist (BSS) during their regular haemodialysis procedure. Verbal education along with printed materials such as patient information leaflets (PILs) and a medication chart was provided to each patient of the intervention group. The control group did not receive any education from the clinical pharmacist and were in contact with only the usual care providers (renal physicians and dialysis nurses). At the end of the week eight (one week after the last education session), BMQ was once again administered to the patients of both intervention and control groups. Medication adherence pattern within and between the study groups was examined using student-paired ‘t’ test. Pearson Chi square test was done to find out the significance difference between two variables. The association between the variables and reported medication adherence pattern was examined using independent student-paired ‘t’ test for two group comparisons and ANOVA for three or more different groups. Tests were two-tailed and a p < 0.05 was considered statistically significant. The statistical analysis was carried out using the statistical package for social sciences (SPSS, Version 10). Table 2. BMQ screen scores for antihypertensives and phosphate binders at baseline and at week eight. *Paired t-test; p < 0.05 is considered as statistically significant. Among the 102 haemodialysis patients enrolled, 90 (68 male and 22 female) completed the study. The baseline difference in the gender, age, education, number of medications, duration of dialysis, residential area (rural, urban and semi urban) of patients were not statistically significant (p>0.05) (Table 1). The differences between the baseline and week eight mean BMQ medication access screen scores of both the control and intervention groups were insignificant (p>0.05). Except seven patients in the control group and five patients in intervention group at baseline, all the remaining patients mentioned that they had problems in paying enough attention to their medication intake and in getting their medication refilled in time. After the pharmacist-provided education sessions, there was a significant (p < 0.05) increase in the number of intervention group patients, who were in the BMQ negative regimen (signifying medication adherence) and belief screens of antihypertensive and phosphate binder medications. But there was no significant increase (p > 0.05) observed in negative recall screens of BMQ for antihypertensive and phosphate binder medications, signifying reported recall barriers to antihypertensives and phosphate binder medications. There was a statistically significant (p < 0.05) increase in the number of intervention group patients, who were in the BMQ negative regimen, belief and recall screens of vitamin D analogues and folic acid. However, no significant (p > 0.05) change was observed in control group patients in negative regimen and belief screen scores of all the four class of medications. This data is presented in Tables 2 and 3. At the baseline, the lowest mean scores were documented for regimen and recall BMQ screens of folic acid medication. The belief screen scores of antihypertensive medications were the lowest, indicating more belief towards effectiveness of antihyperten-sive medications compared to others. The total mean BMQ screen scores of phosphate binders were highest indicating a higher reported rate of nonadherence to phosphate binders followed by vitamin D analogues. Baseline mean scores of all the study patients are presented in Table 4. The study patients were categorized into three groups based on the duration of maintained haemodialysis therapy (Table 1). Regimen screen scores for antihypertensive medications were significantly (p=0.002) lower in patients who were on maintenance haemodialysis therapy for six to twelve months (0.50±0.83) compared to patients of less than six months (1.65±1.28) and more than 12 months (0.75±0.94) of maintained haemodialysis therapy. Belief screen scores for vitamin D analogues were significantly (p=0.02) lower in patients who were on maintenance haemodialysis therapy for six to twelve months (0.83±0.40) compared to patients of less than six months (1.0±0.0) and more than 12 months (0.95±0.20) of maintenance haemodialysis therapy. The regimen screen scores of vitamin D analogues, phosphate binders and folic acid were significantly (p=0.045, p=0.005 and p=0.005) lower in patients who were on maintenance haemodialysis therapy for more than twelve months (0.70±0.46, 0.79±0.41 and 0.58±0.50) compared to patients of less than six months (0.90±0.30, 0.96±0.18 and 0.86±0.34) and six to 12 months (1.0±0, 1.16±0.40 and 1.0±0.0) of maintenance haemodialysis therapy. The recall screen scores for folic acid were also significantly (p=0.008) lower in the patients who were on maintenance haemodialysis therapy for more than 12 months (0.95±0.20) compared to patients of less than six months (1.0±0.0) and six to 12 months of maintenance haemodialysis therapy (1.16±0.40). The income of patients was categorized into three groups (Table 1). Patients with higher income had significantly (p=0.004) lower access screen scores for all medications (0.70±0.46) indicating a better accessibility to all the medications, compared to patients in the low (1.0±0.0) and medium income groups (0.88±0.32). No significant differences in BMQ adherence screen scores were observed among the categories based on gender, age, educational levels, number of medications taken per day, marital status and residential area for all the four class of medications assessed. Identification of the factors determining poor adherence to medication regimens is beneficial for healthcare professionals since it helps them to recognize patients who may benefit from interventions to improve medication adherence . Adherence research conducted in developed countries has examined associations between patient characteristics (demographic, disease and treatment characteristics) and adherence behaviour in haemodialysis patients [4-6, 8]. But no such data is available establishing any relationship between haemodialysis patient characteristics and medication adherence behaviour in the Indian context, where the socioeconomic and cultural background of patients differ from those in developed countries. Compared to baseline, there was a significant reduction in the mean BMQ regimen, belief and recall scores of inter-vention group after the education sessions provided by the clinical pharmacist. After the education sessions there was also a noteworthy decrease in the proportion of intervention group patients who accounted for missed dose(s) of antihypertensives, phosphate binders, folic acid and vitamin D analogue medications in the past week. Patients reporting difficulty in remembering to take their medications decreased after the pharmacist-provided education sessions, which reflected in increase in the number of intervention group patients in the negative screen of BMQ at week eight. However, no significant (p>0.05) reduction in the mean BMQ scores of control group participants was observed. This indicates that clinical pharmacist-provided education had a positive influence on medication adherence behaviour of haemodialysis patients a finding consistent with previously published reports in this area . Considering the mean BMQ medication screen scores as an adherence determining parameter, the extent of nonadherence was reported to be low for folic acid followed by antihypertensive medications, and high for phosphate binder. But, if we consider the negative screen of BMQ as an adherence-determining parameter, the adherence pattern changes altogether; because, more patients were in the negative regimen and belief screen of antihypertensive medications (n=28 and n=41) than those of folic acid medication (n=18 and n=1). The negative BMQ screen signifies the number of patients who reported adherence to their medications and scored zero. To arrive at a conclusion, mean BMQ screen scores alone cannot be taken into consideration for predicting adherence, because these scores were of those patients who were in positive screen, a factor signifying nonadherence or some belief or recall barrier to adherence. Based on the number of patients in the negative screen of BMQ, patients reported better adherence to antihypertensive medications than to folic acid and that it was low for phosphate binders followed by vitamin D analogues. Table 3. Baseline mean scores of study patients for all the four categories of medication. Past researches have shown that nonadherence is most prevalent for phosphate binders among the medications that are commonly received by the haemodialysis patients . Our finding was consistent with the findings of previous studies where investigators had reported a higher rate of nonadherence to phosphate binders compared to other medications such as antihyperten-sive and vitamin D medications [6, 7, 18, 19]. The higher reported rate of nonadherence to phosphate binders might be due to the belief /recall barriers reported by the haemodialysis patients such as lack of belief in the effectiveness of phosphate binder. Prior to education sessions, a good number of study patients had limited knowledge/poor understanding of the exact role of phosphate binders, vitamin D analogues and folic acid. Phosphate binders and vitamin D analogues have an indirect role in management of chronic renal failure, which is difficult to understand for patients. This might have contributed for the limited understanding of the rationale of taking these medications. Insufficient knowledge and poor understanding of the prescribed medications has been reported in the literature as possible cause of nonadherence [20, 21]. A majority of the study participants had good understanding of the usefulness of anti-hypertensive medications compared to the other three classes of medications. A good number of these patients believed that their antihypertensive medications were working very well for them. This reflected in a lower belief screen scores for antihypertensive medications, signifying more belief in the effectiveness of antihypertensive medications. In our study, the total family income of the haemodialysis patients was found to be associated with the access screen scores. These findings were consistent with the findings of Bame et al. where in they had reported that low-income dialysis patients are less likely to adhere with their medication regimen . Study subjects who were maintained on haemodialysis for more than a year reported a better adherence and understanding of their phosphate binders, vitamin D analogues and folic acid regimen, compared to those who were maintained on haemodialysis for less than a year. This may be due to the gradual medication related information they have received over a period of time (>1 year) from different members of renal health care team or family members or some time from another hemodialysis patient, who is familiar with the use of these medications. These findings were not in consonance with the earlier notion that in chronic disease patients’ adherence rate is likely to diminish over a period of time [22, 23]. We did not observe any association between the gender, age, educational levels, marital status, residential area, number of medications received/day with the patients' adherence to their antihypertensive, phosphate binders, vitamin D analogues and folic acid medication regimen. However, some studies have shown an association between the patients’ age and their medication adherence [6, 24]. There are few limitations with this study. Medication adherence was measured using self reported behavioural measure. Adherence to medications may be overestimated by this method. The improvement in the reported medication adherence scores was not correlated to the patients' clinical parameters such as blood pressure and serum phosphate levels. It is possible that improvement in the medication adherence has been overestimated in our study as the same pharmacist who educated the patients assessed the medication adherence of the intervention and control group, contributing some possible bias towards intervention group. The short duration of follow up of the study patients is another limitation. In conclusion, clinical pharmacist-provided patient education was effective in increasing the medication knowledge and adherence pattern of haemodialysis patients. To identify the factors that influence adherence and to assess the influence of other interventional strategies on medication adherence, further research is required to evaluate whether improvements in knowledge and adherence are sustained in the longer term, and whether the education affects clinical outcomes. We are grateful to Bonnie L. Svarstad for permitting us to use BMQ for our study. The authors sincerely thank JSS Mahavidyapeetha and Principal, JSS College of Pharmacy, Medical Superintend of JSS Hospital for their support. We also extend our thanks to Dr C.B. Murthy, Director, Basappa Memorial Hospital, Mysore, and to all the patients and dialysis staff of both JSS Medical College Hospital and Basappa Memorial Hospital for their help and cooperation during the study period. We thank Rohan Elliott, Senior Clinical Pharmacist, Medical center for the comments and suggestions on the draft version of the manuscript. Anderson RJ. Prescribing medication in dialysis centers. Am J Kidney Dis 1983; 3: 104-5. Manley HJ, Drayer DK, Muther RS. Medication-related problem type and appearance rate in ambulatory haemodialysis patients. BMC Nephrol 2003; 202: 4-10. Lundin AP. Causes of noncompliance in dialysis patients. Dialysis Transplant 1995; 24: 174-6. Safdar N, Baakza H, Kumar H, Naqvi SA. Non-compliance to diet and fluid restrictions in haemodialysis patients. J Pak Med Assoc 1995;45: 293-5. Kimmel PL, Peterson RA, Weihs KL, Boyle DH, Verme D, Umana WO, Veis JH, Alleyne S and Cruz I. Behavioural compliance with dialysis prescription in haemodialysis patients. J Am Soc Nephrol 1995; 5: 1826-34. Bame SI, Petersen N, Wry BP. Variation in haemodialysis patient compliance according to demographic characteristics. Soc Sci Med 1993;37: 1035-43. Cleary DJ, Matzke GR, Alexander AC, Joy MS. Medication knowledge and compliance among patients receiving long-term dialysis. Am J Health Syst Pharm 1995; 52: 1895-900. Curtin RB, Svarstad BL, Keller TH. Haemodialysis patients' non-compliance with oral medications. ANNA J 1999; 26: 307-16. Kutner NG. Improving compliance in dialysis patients: Does anything work? Semin Dial 2001;14: 324-7. Batson H, Schwartz M. Techniques to improve compliance in hemo- and peritoneal dialysis patients. Nephrol News Issues 1999; 58; 54-8. Skoutakis VA, Acchiardo SR, Martinez DR, Lorisch D, Wood GC. Role-effectiveness of the pharmacist in the treatment of haemodialysis patients. Am J Health Syst 1978; 35: 62-5. Matzke GR, St Peter WL, Comstock TJ, Foote EF. Nephrology pharmaceutical care preceptorship: A programmatic and clinical outcomes assessment. Ann Pharmacother 2000; 34: 593-9. Sakhuja V, Sud K. End-stage renal disease in India and Pakistan: Burden of disease and management issues. Kidney Int Suppl 2003; 63: S115-8. Barsoum RS. Chronic kidney disease in the developing world. N Engl J Med 2006; 354: 997-9. Svarstad BL, Chewning BA, Sleath BL, Claesson C. The brief medication questionnaire: A tool for screening patient adherence and barriers to adherence. Patient Educ Couns 1999; 37: 113-24. Tomasello S, Dhupar S, Sherman RA. Phosphate binders, K/DOQI guidelines, and compliance: The unfortunate reality. Dialysis Transplant 2004; 33: 236-40. Hartman PE, Becker MH. Noncompliance with prescribed regimen among chronic haemodialysis patients: A method of prediction and education diagnosis. Dialysis Transplant 1978; 7: 978-86. Cummings KM, Becker MH, Kirscht JP, Levin NW. Psychological factors affecting adherence to medical regiments in a group of haemodialysis patients. Med Care 1982; 20: 567-80. Makaryus AN, Friedman EA. Patients' understanding of their treatment plans and diagnosis at discharge. Mayo Clin Croc 2005; 80: 991-4. Rosner F. Patient noncompliance: Causes and solutions. Mount Sinai J Med 2006; 73: 553-9. Curtin RB, Svarstad BL, Andress D, Keller T, Sacksteder P. Differences in older versus younger haemodialysis patients' noncompliance with oral medications. Geriatr Nephrol Urol 1997; 7: 35-44. Krueger KP, Felkey BG, Berger BA. Improving adherence and persistence: A review and assessment of interventions and description of steps toward a national adherence initiative. J A Pharm Assoc 2003; 43: 668-9.